As millennials–currently ages 19-35–move to parenthood, three-quarters (77 percent) support a create-your-own approach to education, where students can determine a path best suited for their learning style. 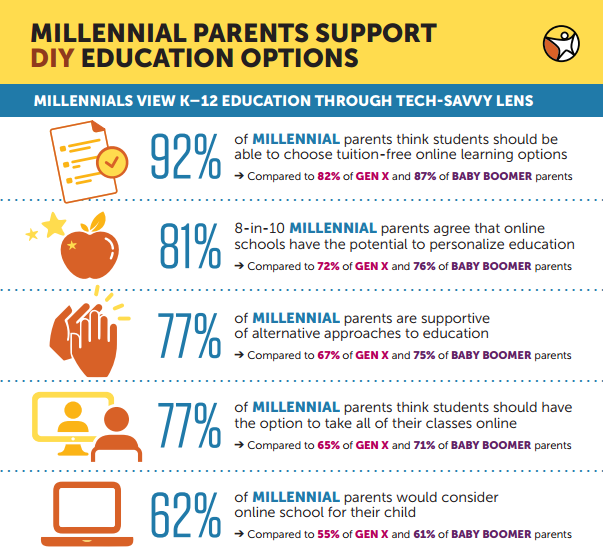 The majority of Americans (76 percent), and 92 percent of millennial parents, feel that their children should be able to choose tuition-free online learning options that meet their individual needs. Eighty percent of millennial parents agree that online schools can lead to more personalized education, compared to 72 percent of Gen X and 76 percent of baby boomers. Of the current millennial parents, 48 percent have taken an online course. The survey also found 77 percent of millennial parents think students should be offered an option to take all of their courses online. Sixty-five percent of Gen X and 71 percent of baby boomer parents agree.